Soak shiitake mushrooms and wood-ears for 30 minutes in warm water. Mix cornflour with 2 tbsp of water and set aside. Trim and discard the stems from shiitake mushrooms and cut off the hard part from the wood-ears. Cut button mushrooms into quarter. Chop garlic finely. 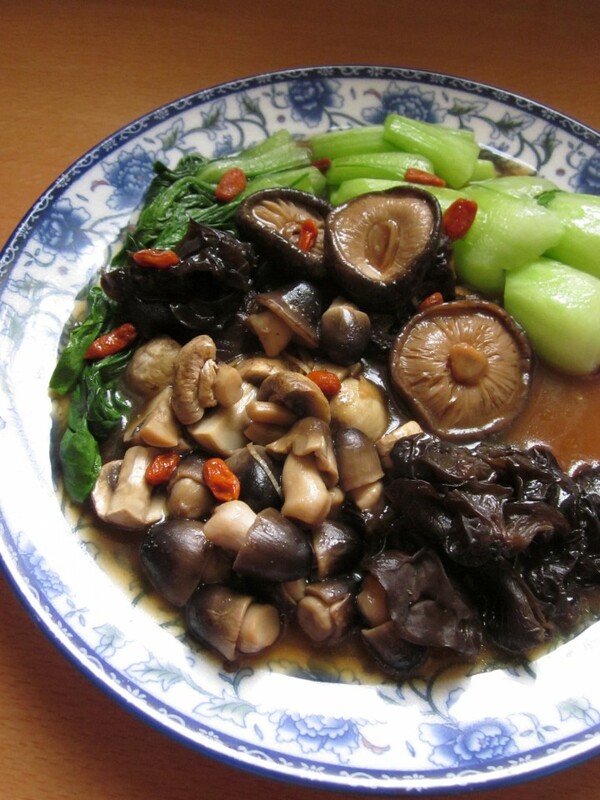 Fry chopped garlic in a wok until light brown before adding vegetarian oyster sauce, ginger, water and soaked mushrooms and wood-ears. Boil for 5 minutes and simmer for about 30 minutes on very low heat. Add in button mushrooms and straw mushrooms to cook for another 2 minutes. Boil a pot of water on the side. When the water starts to boil, add a little salt and blanch bok choy for 2 minutes. Arrange bok choy on the side of the plate. Add sesame oil, wolf berries and Chinese wine to the braised mushrooms. Thicken with cornflour mixture and season with salt and pepper to taste. Scoop out the braised mushrooms and place on the side of the bok choy. Serve hot, accompany with rice.